For the American guitarist, see Steve Cardenas (musician). Stephen Antonio Cardenas (born May 29, 1974) is an American martial artist, musician, and semi retired actor. Cardenas is best known for playing the character Rocky DeSantos, which was the second Red Power Ranger in Mighty Morphin Power Rangers and eventually became the Blue Zeo Ranger in Power Rangers Zeo, two seasons later. Cardenas was born Stephen Antonio Cardenas on May 29, 1974 in Hampton, Virginia, at the Langley Air Force Base. Spending his early childhood as a military brat, Cardenas was raised in San Antonio, Texas. He is of Mexican descent. He started training in martial arts when he was about 12 years old and reached black belt in Taekwondo at age 16. Steve Cardenas has been in martial arts for 28 years. He earned 5th degree black belt in Taekwondo and a black belt in Brazilian Jiu-Jitsu. At age 20, Cardenas left his native Texas and settled in Los Angeles to audition for a Mighty Morphin Power Rangers role that would change his life. His character, Rocky DeSantos, replaced Jason Lee Scott (played by Austin St. John) as the Red Ranger in the Mighty Morphin Power Rangers TV series (eventually the Gold Ranger in Zeo), and he later became the Blue Ranger for Power Rangers Zeo. He had no previous acting experience and had to learn on the job. Cardenas left the Power Rangers series and retired from acting during Power Rangers Turbo, due to contract disagreements, and possibly to focus on his martial artist career. Many years later, starting at the 2007 Power Morphicon convention, he began making convention appearances with other former cast members. After Power Rangers, he owns a martial arts studio in Burbank, California and one in his hometown of San Antonio. In 2009, he started a kids-specific program at Hollywood Brazilian jiu-jitsu studio in West Hollywood, and in 2011 he opened the Force/Balance Brazilian jiu-jitsu & Yoga school. Cardenas had become interested in Brazilian jiu-jitsu after losing a friendly match against "a blue belt in BJJ... [he] choked me out in 10 seconds! He was only training for a year and a half at that time and I had been training for 10 yrs. It was an immediate eye opener." The style was more difficult for him to learn than other martial arts disciplines. He holds multiple awards from martial arts contests, including two Silver Medals at Copa Pacifica (2009 and 2011), Gold Medal winner of the 2009 American National Championship, Gold Medal in the 2010 Jujitsu Pro Gear Open, and Silver Medal in the 2010 No-Gi World Championships. In 2017, he starred in the short movie The Order alongside : Austin St. John, Catherine Sutherland, David Yost, Johnny Yong Bosch, Paul Schrier, Karan Ashley, Walter Emanuel Jones, Erin Cahill, Blake Foster, Nakia Burrise, Hilary Shepard Turner, Dan Southworth, Alyson Sullivan, Deborah Estelle Phillips and Azim Rizk. For the first time since Power Rangers Turbo, Cardenas returned to the Power Rangers Franchise in Power Rangers Super Ninja Steel for the 25th anniversary Episode reprising his role as Rocky DeSantos. ^ Michael Mammano (2013-12-05). "Interview With Power Rangers' Steve Cardenas | Den of Geek". Denofgeek.us. Retrieved 2015-12-12. ^ "Official Steve Cardenas Interview!". RangerBoard.com. Retrieved 2015-12-12. ^ Steven Vanderpool (2011-08-02). "Forever Red: Steve Cardenas Talks 'Power Rangers' and Force/Balance Brazilian Jiu-Jitsu & Yoga!". Iconvsicon.com. Retrieved 2015-12-12. ^ "Interview With Power Rangers' Steve Cardenas - Dec 5, 2013". Dennis Publishing. Retrieved February 6, 2016. ^ "The Order on aceofgeeks.net". Archived from the original on 2016-10-22. Retrieved 2016-10-21. 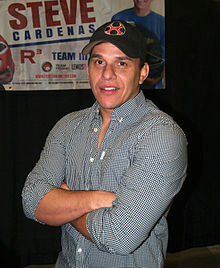 Wikimedia Commons has media related to Steve Cardenas.